Virtually every American alive has at some point consumed one, and probably more than one, consciousness-altering drug. Even those who actively eschew alcohol, tobacco, and coffee cannot easily avoid the full range of psychoactive substances pervading the culture. Yet, if the use of drugs is a constant in American history, the way they have been perceived has varied extensively. Just as the corrupting cigarettes of the early twentieth century ("coffin nails" to contemporaries) became the glamorous accessory of Hollywood stars and American GIs in the 1940s only to fall into public disfavor later as an unhealthy and irresponsible habit, the social significance of every drug changes over time. 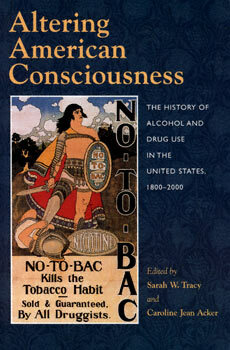 The essays in this volume explore these changes, showing how the identity of any psychoactive substance--from alcohol and nicotine to cocaine and heroin--owes as much to its users, their patterns of use, and the cultural context in which the drug is taken as it owes to the drug's documented physiological effects. Rather than seeing licit and illicit drugs, recreation drugs and medicinal drugs, "hard" drugs and "soft" drugs as mutually exclusive categories, the contributors challenge readers to consider the ways in which drugs have shifted historically from one category to another. "This is a terrific book. Not only do the essays stand well on their own, but these pieces interact very exciting and suggestive ways, giving the volume the feel of an integrated study. This is a mjor contribution." "Greatly enriches our understanding of the history of drug use in America, with particular reference to the ways that changing social attitudes intersect with legal, medical, and political aspects of addiction. . . . A welcome addition to the field."